Silk-effect pearl grey lacquer Silk-effect pearl grey lacquer with tone-on-tone hand-painted decor. Wall unit doors with tempered Satin glass panels and pearl grey hand-painted decors. Polished silver finish Etnica handle. Honed matt grey, 4 cm thick, Carrara marble top. The door panel can be beautified by a decor in delicate tone-on-tone shades or in contrasting colors. The same decor also beautifies the turned columns. The side pilasters on the hood can be pulled out and fitted with accessories on the inside. Charm and practicality are indissolubly combined in Etoile: the work area is impressively large and the open units multiply the storage space available. 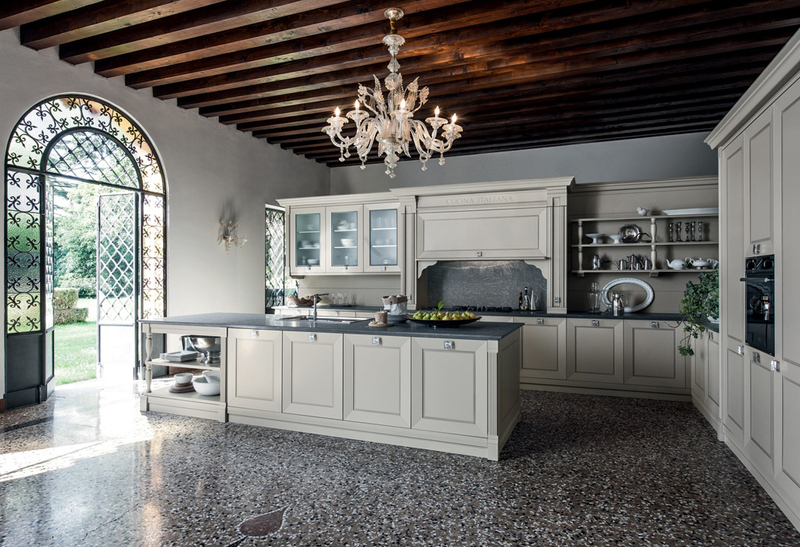 The Etoile hood is very eye-catching and can be completed by the silk-screen printed wording “Cucina Italiana” (Italian kitchen) that celebrates the identity and prestige of this model. The polished Silver Etnica handle sets off the beauty of the doors. The top of the hood is embellished by finely decorated capitals while the central panel has a top-hung opening.